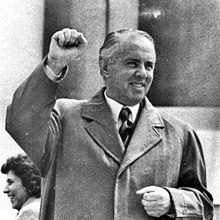 Enver Halil Hoxha (pronooncit [ɛnˈvɛɾ ˈhɔdʒa] ( listen); 16 October 1908 – 11 Aprile 1985) wis the leader o Albanie frae the end o Warld War II till his daith in 1985, as the First Secretary o the Party o Labour o Albanie. He servit as Prime Meenister o Albanie frae 1944 tae 1954 an aw, Meenister o Defence frae 1944 tae 1953, Meenister o Foreign Affairs frae 1946 tae 1953, Chairman o the Democratic Front frae 1945 tae his daith, an as Commander-in-Chief o the Albanie airmit forces frae 1944 tae his daith. Hoxha's leadership wis characterisit bi his proclaimit firm adherence tae anti-reveesionist Marxist-Leninism frae the mid 1970s onwards. Efter his break wi Maoism in the 1976–1978 period, numerous Maoist pairties declared thairsels Hoxhaist. The Internaitional Conference o Marxist-Leninist Pairties an Organizations (Unity & Struggle) is the maist well kent collection o thir pairties the day. Wikimedia Commons haes media relatit tae Enver Hoxha. This page wis last eeditit on 25 Februar 2018, at 01:42.